According to generally-accepted laws, banks are vested with public interests. This is because they play a key role in maintaining the financial stability and equilibrium in an economy. As per bank analysts, the banking industry is characterized by tough competition. 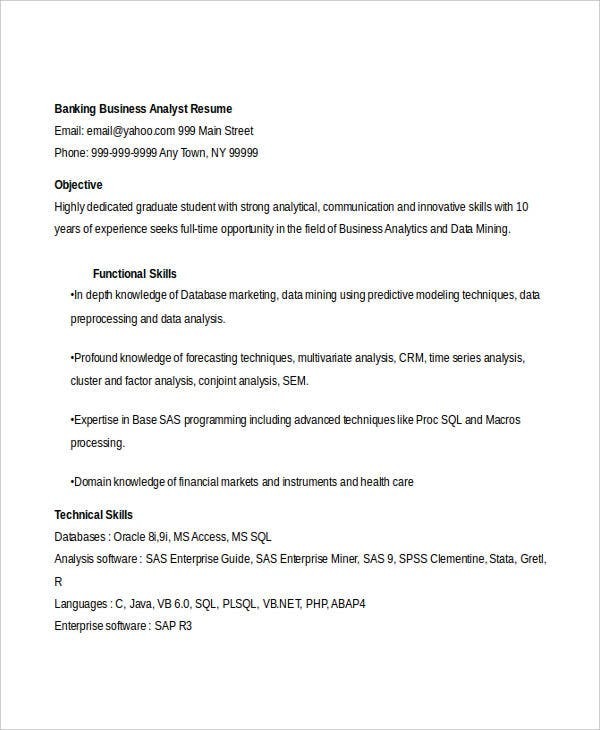 For those who are planning to apply for a bank position, you have to brace yourselves and take time in updating and reviewing your sample resume. 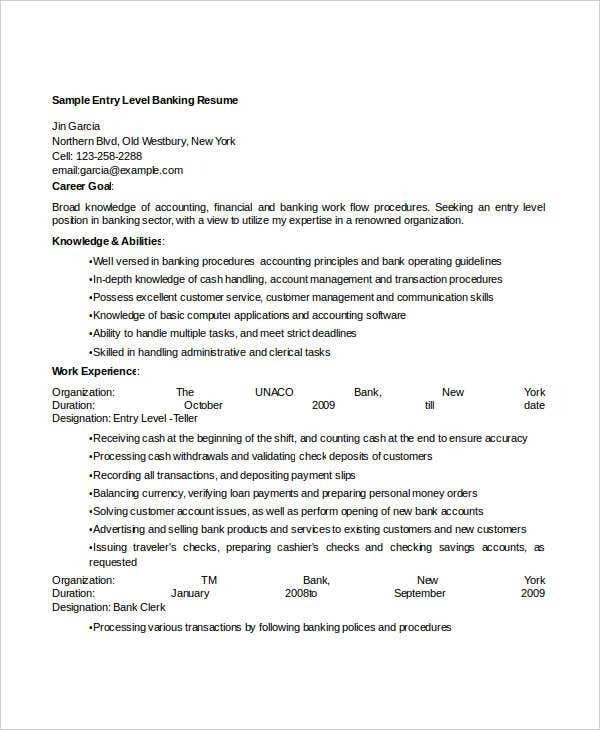 In editing and updating your banking resume, you may check out our list of bank resume templates to guide you through the process. 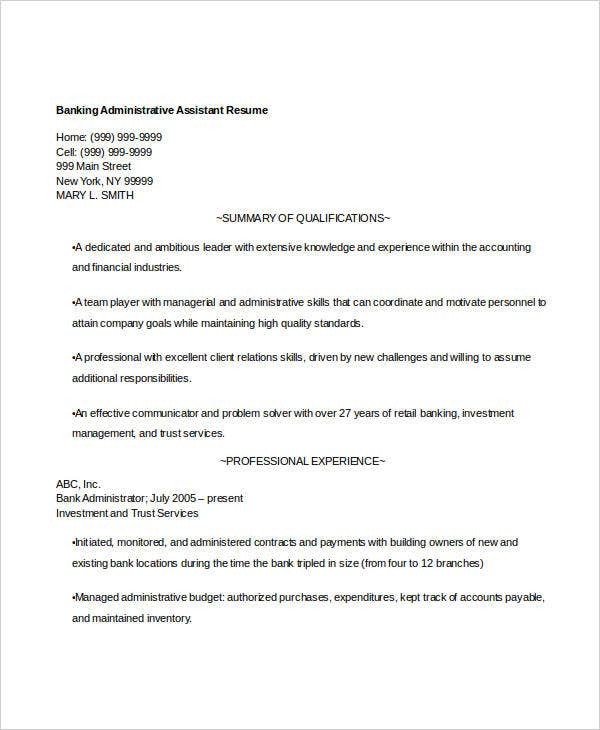 The sample resumes provided cater to a specified banking position that you may happen to apply. You should have financial literacy. According to the Guardian, banks are eager to see and accept applicants that have a strong financial background. You must showcase in your resume the various financial courses and work-related experiences regardless of the position you’re applying, may it be for bank teller resumes or other professional banking positions. Showcase your skills. These skills may refer to problem-solving and critical thinking. You should have to drive to think outside the box, but still able to reconcile your ideas with the established policies of the bank. 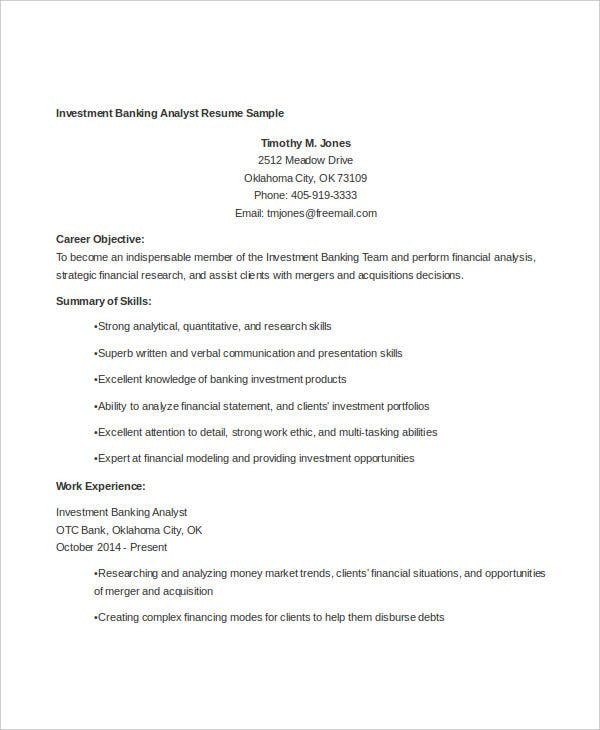 Banking resume samples will give you examples of skills that most banks require aside from academic competencies. You should be good in dealing with different people. Because banks cater to different types of people every day specifically different races, cultures, and mind-setting, you should have the skill to deal with them accordingly. You should have the patience and the initiative to determine what your client’s problems are and how you can efficiently fix it. Provided that there are a many types of banks, the number of banking positions approximately increase everyday. If you’re planning to apply for a bank position, the one of the following templates may suit such position. 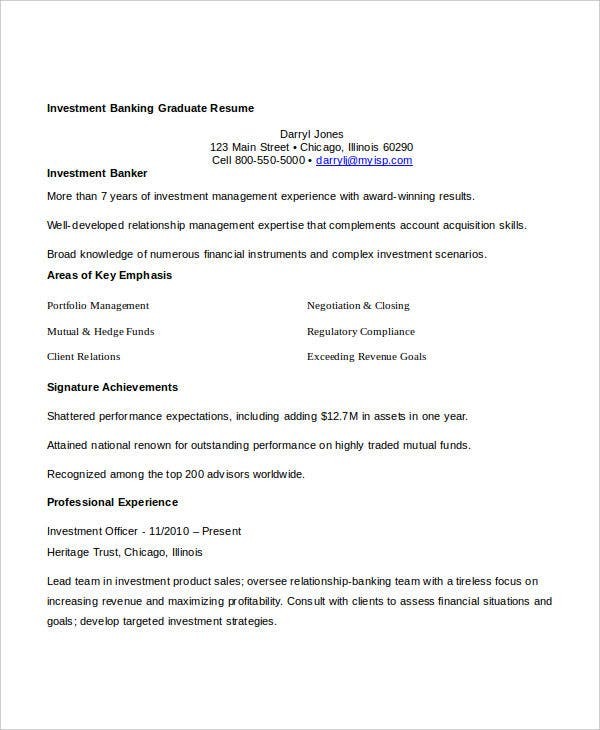 Investment Banking Resume Templates – Investment banking is a specific branch of the banking industry that deals with the generation of capital for the benefit of other companies and in aiding government entities. If you’re planning to apply in this kind of setting, you’ll be rending specific banking aid and services to certain entities. You can be an analyst, banking associate, or any other investment banking professional. 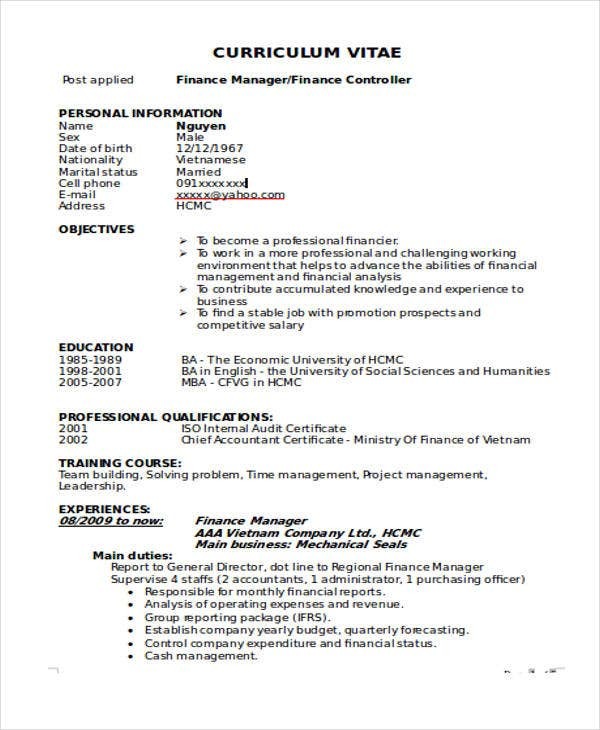 Banking Finance Manager Resume Templates – For this banking position, this mostly requires a series of experiences in the banking industry. As a manager, you should know every aspect and process of the business. That is why you should clearly emphasize in your resume your work-related experiences, managerial skills, leadership skills, and credentials. 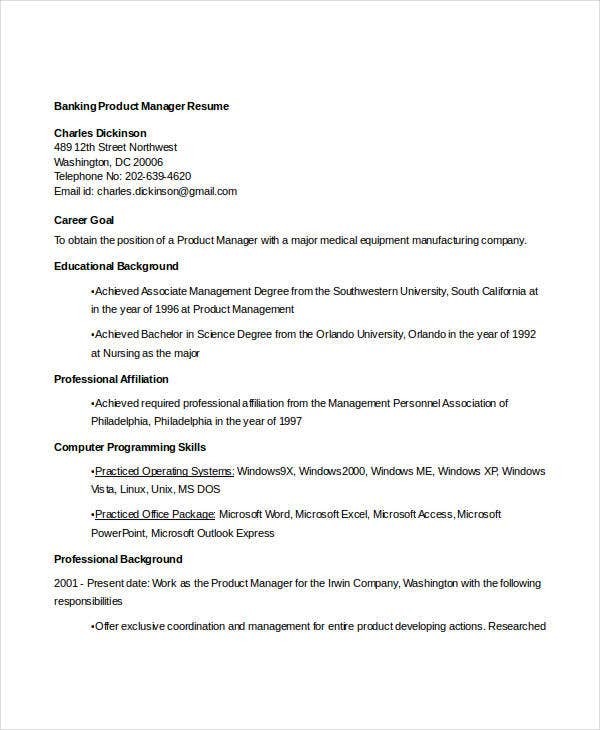 Entry- Level Banking Resume Templates – In contrast to the banking manager resume, banking resume templates are also applicable to entry-level resumes and applicants. If you’re still new in the banking industry, you should prove to the hiring managers that you have a strong academic background either in finance or other business related courses. Cashier resumes are useful in knowing what are desired characteristics of bank cashiers. Regardless of the banking position, a certain level of diligence is required from bank personnel. 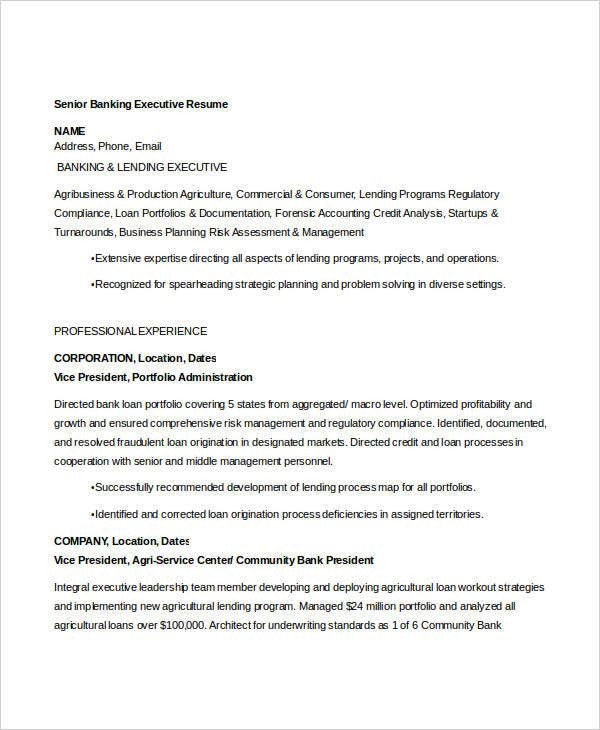 Commercial Banking Resume Templates – There are a variety of work positions that you may apply in commercial banks that is why your resume must be good enough to stand out from the pack. Commercial banking deals with loans, payment services, credit, and many more. You should have basic knowledge about those fields so that the employers can see your confidence not just during the interview but in your resume as well. 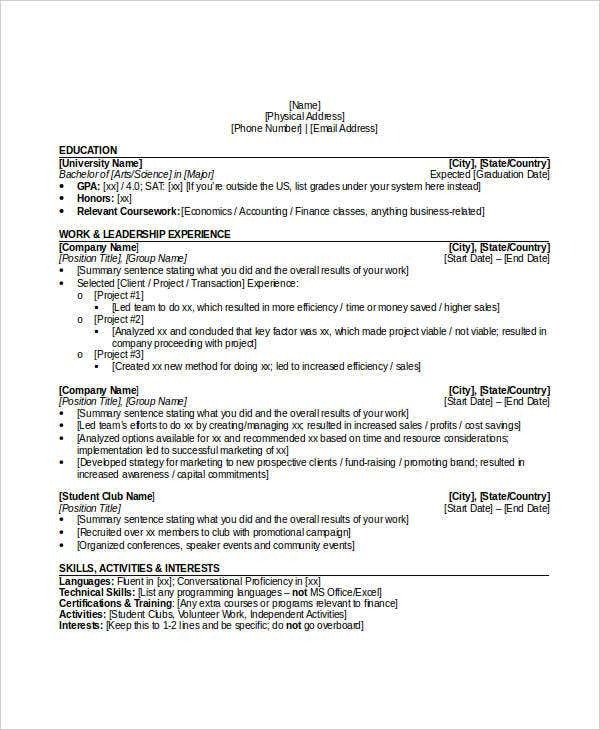 A key point that you need to remember in writing a banking resume is tailored the structure and outline of your resume in accordance with the nature and type of job position you’re applying for. You may refer to the basic steps below. Make it simple. Simple banking resumes convey professionalism and formality. The banking industry deals with finance and other services that require utmost professionalism on the end of the job applicant. As much as possible, use a simple and straightforward outline. Ace your executive summary. For experienced professionals, it is advisable that you present an executive summary. The said summary will provide a breakdown of your significant experiences in the banking industry which show how you can effectively contribute to the operations of the bank. Provide your educational background. In here, you need to identify the academic institutions you’ve attended and the courses that you’ve completed or taken up. You can also include the academic awards and honors that you’ve received to boost your educational competency. Provide your skills. These could refer to leadership, financial, and banking skills that you’ve acquired from legitimate institutions or training programs. 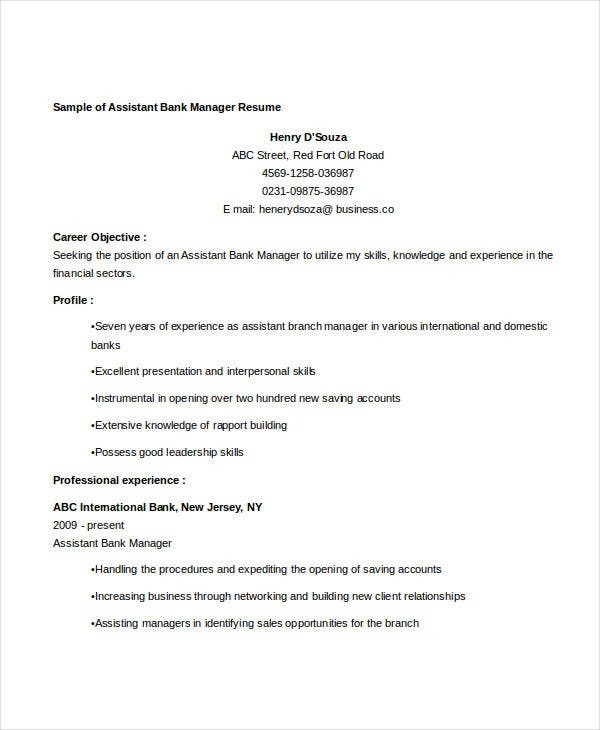 Provide your work experiences – Banking resume examples would help you know how to effectively write your work experiences in a unique and professional manner, including the keywordsMake it simple. Simple banking resumes convey professionalism and formality. The banking industry deals with finance and other services that require utmost professionalism on the end of the job applicant. As much as possible, use a simple and straightforward outline. 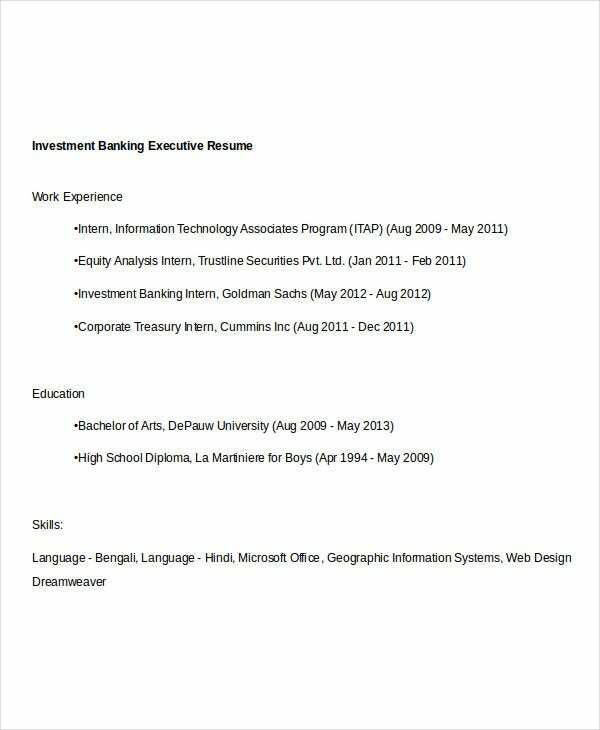 Provide your work experiences – Banking resume examples would help you know how to effectively write your work experiences in a unique and professional manner, including the key words and appropriate verbs. and appropriate verbs. 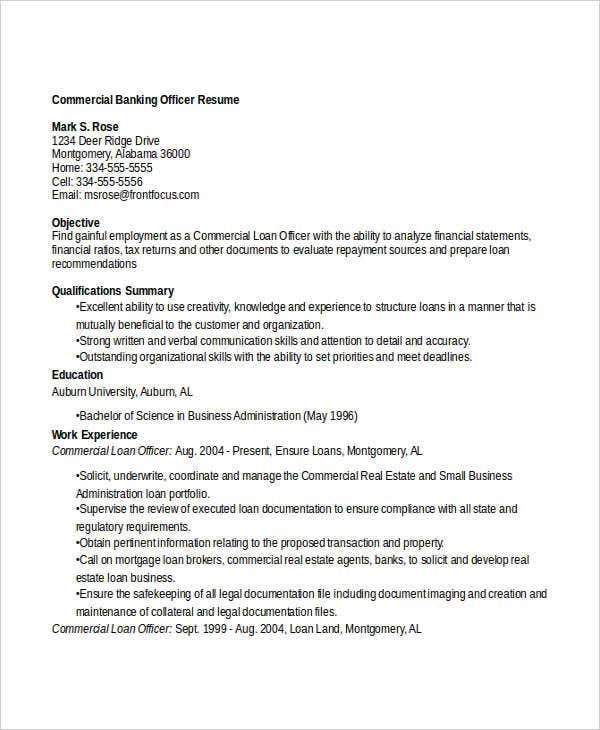 In writing your banking resume, considering both the format and content is not enough. You need to apply the holistic approach that is including the kind of language you should use. Here are some points you need to consider. Don’t use generic statements. 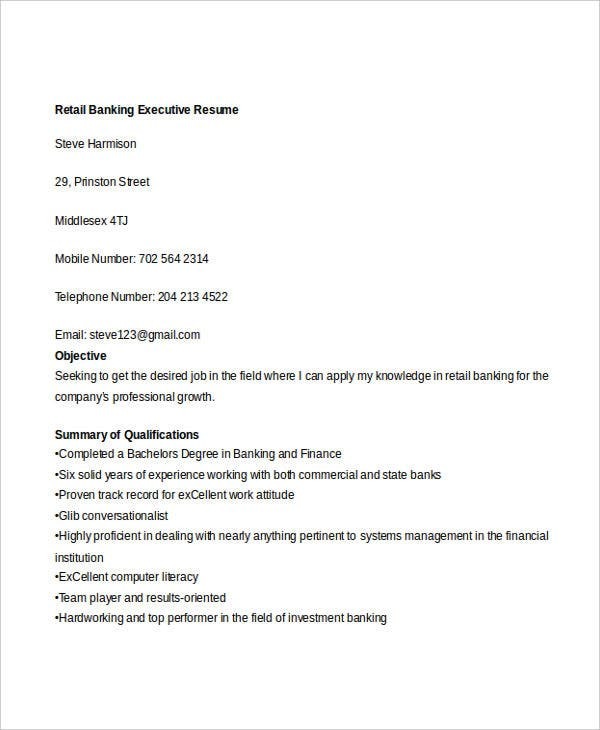 If you try to look into best banking resumes, most statements are written with utmost particularity. The more specific the statements are, the better is the content of your resume. 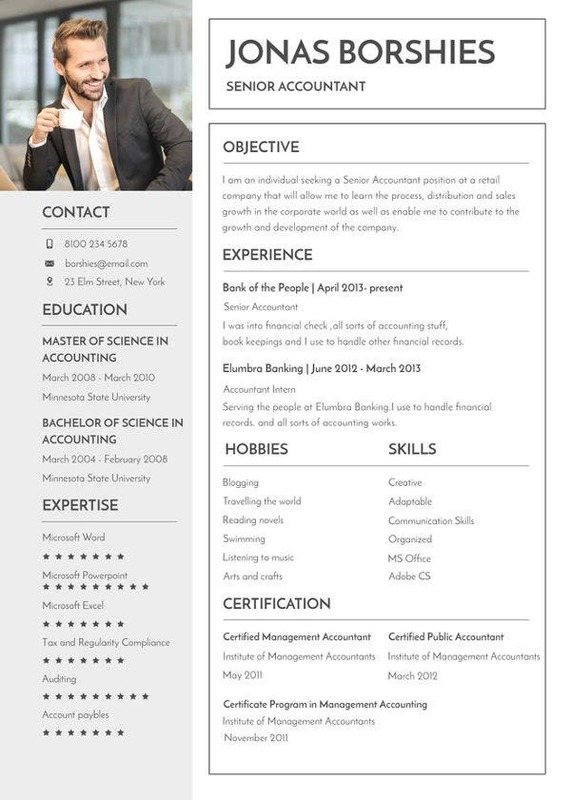 Fresher resume formats can give you an idea as to how major and minor points in a resume are written. Make use of banking keywords. Keywords are crucial in allowing your resume to pass the initial screening processes. Examples of such are financial statements, streamlined, efficient service, high-risk customers, currency fluctuations and many more. Use technical jargon appropriately. You may make use of technical jargon provided that the industry you’re applying for is acquainted with it. It can also serve as a keyword at the same time. Bear in mind that best resume templates and banking cover letters are mostly characterized by positive, formal, and professional statements or sentences.